So every since I have seen Alicia Vikander in Louis Vuitton showstopper on the Oscar’s red carpet I have an need for yellow in my wardrobe. Its such a great colour and really puts you in the mode for spring time. So we’ve checked around and found some great pieces you can wear and for a fraction of the price…. Starting of the yellow trend we have this great Bardot off the shoulder body con dress by High Street favourite River Island (£55 product no:680171). Its a great bold colour perfect for a night out on the town. If you are a little scared of such a bold colour try pairing it with darker accessories (Blacks & Greys) and even throwing over a leather jacket to break down the colour. If however you are not brave enough to go head to toe yellow why not try a blouse that has a base colour of yellow but introduces in some neutral tones in the print. We have found this great one at The Kooples (£95 Selfridges.com). This blouse is a great introduction to the colour yellow as it is very subtle and a great piece for wearing smart under suiting or casual with a pair of jeans. 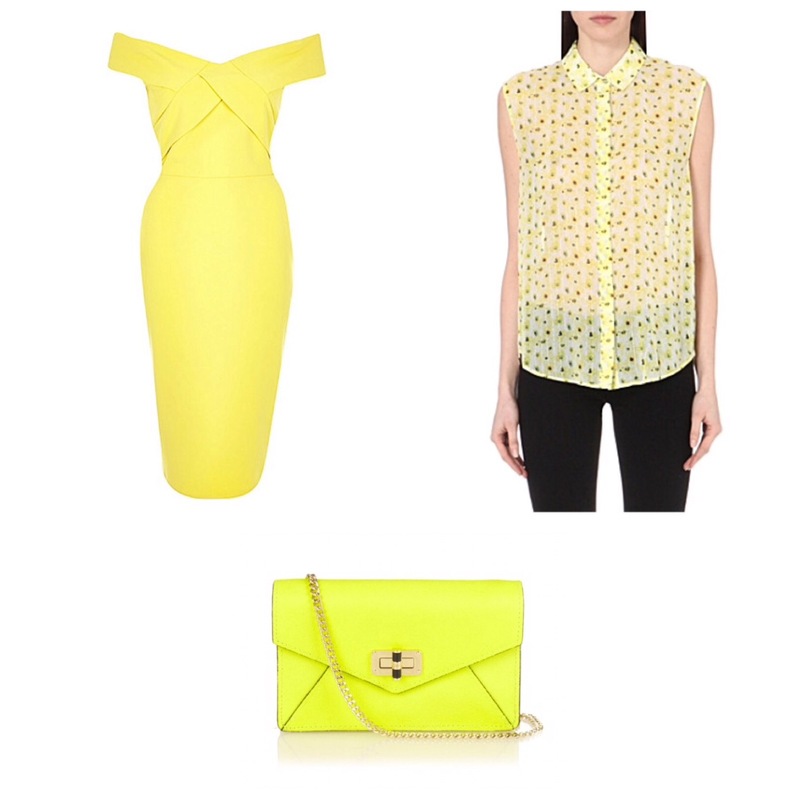 If however wearing yellow is just to scary why not go for the easiest of options… Accessories. You can not go wrong with a colour pop handbag and this perfect little cross body bag is the spring accessory you’ve been needing (DVF at matchesfashion.com £90). Just the right size to pop your essentials in for a day out and about.